20-07-2004 4:00 am Lebanese writer Nadia Al-Jurdi Nouaihed and the Cuban cultural institution Casa de las Américas will receive the 2002-2003 Simón Bolívar Prize, awarded by UNESCO and the government of Venezuela on Wednesday July 21 (Room II, 7 p.m.). 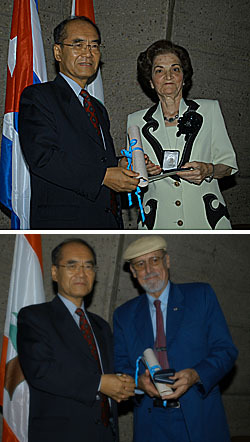 Both laureates were chosen by an international jury to share the US$25,000 prize, which will be presented to the writer and to the President of the Casa de las Américas, Roberto Fernández Retamar, by the Director-General of UNESCO, Koïchiro Matsuura, in the presence of Venezuela’s Minister for Foreign Affairs, Arnaldo Pérez. Nadia Al-Jurdi Nouaihed, born in Choueifat (Lebanon) in 1929, lived in Venezuela for ten years. Her works include Nisaa min Biladi (Women of My Home Country) and Kalimat min Zahab (Words of Gold), she is also an expert on Simón Bolívar whose work she has promoted in the Arab-speaking world through her book Muharer Simon Bolivar (The Liberator Simón Bolívar), published in 1994. Casa de las Américas, established in Havana in 1959, disseminates works by artists, writers and playwrights, and musicians, as well as art and literature critics from all over the world. In 1960 it started publishing a review, also named Casa de las Américas, which is considered to be one of the leading cultural publications in the Spanish language. The purpose of the International Simón Bolívar Prize is to reward an activity of outstanding merit, which, in accordance with the ideals of Simón Bolívar, has contributed to the freedom, independence and dignity of peoples and to the strengthening of solidarity among nations. Such activity may take the form of intellectual or artistic creation, a social achievement or the mobilization of public opinion. Photo © UNESCO Nadia Al-Jurdi Nouaihed (left) and the President of the Casa de la Américas, Roberto Fernández Retamar (right).